YASSS we are so excited for your nerd night talk. Download the template (20 slides, 20 seconds each). If you prefer to set timings on your own template see the steps below. Like our Facebook page (click above), if you want to be tagged as we promote. 20 slides should have content only. Don't include a "title" or "Thank you" slide, we'll do that for you! 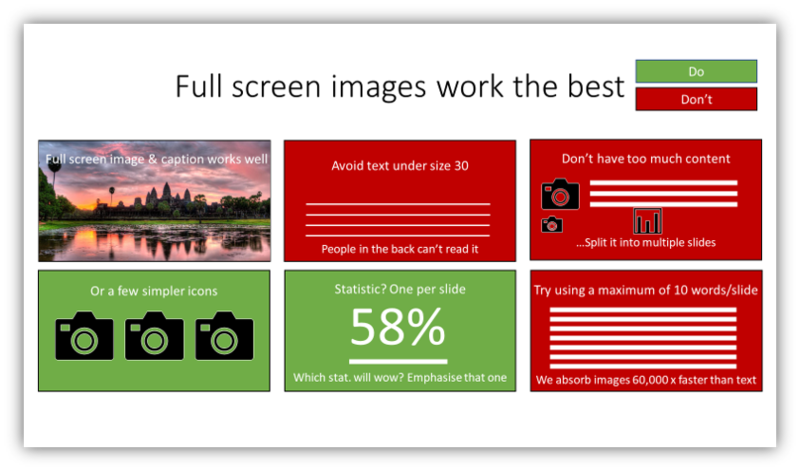 The best NN slideshows are minimal, ideally aim for 1-3 images & captions only on each slide. Your hosts will help, especially at Nerd Lab before the event! 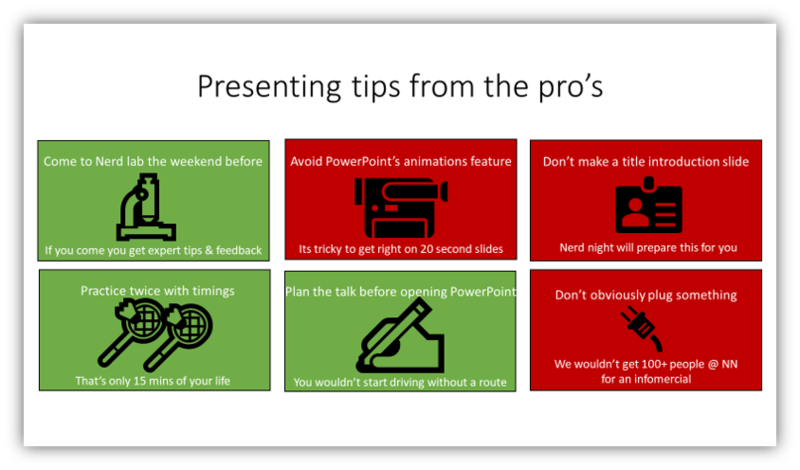 If you're promoting an organisation or event keep it to the LAST TWO SLIDES ONLY! Read on for tonnes of other stuff: A timeline, Promoting & censoring, Nerd Lab specifics, presentation tips & PowerPointers! 1. TELL, don't SELL. Nerd Night is a community event, not a way for you to get free advertising. Your audience is going to be there wanting to hear about your nerdy passion and learn something. If you give them a 400-second infomercial on why they should sign up for your business or come to your event or whatever, you will anger the gods of Nerdom, and you will look like a tool. At the end of your interesting, informative talk, of course, you can mention your organization or event in passing. We ask that you limit this to the last two slides of your presentation at maximum, keep it classy. 2. If your talk might make some people uncomfortable, let us know. We aren't interested in censoring presentations (and we're a volunteer organization, so we don't have time anyways), but if you have a talk that's going to make people in the audience a little uncomfortable (say, a group of Khmer students and their teachers; conservative grandmas; the faint of heart), let us know and we'll put you after the intermission so it's less awkward for you and them. What happens at Nerd Lab? Meet your fellow speakers and hosts. Rehearse what you have! Ideally, your presentation is 80% there; some people bring a fully-loaded 400-second presentation, and some people just bring their outline or notes. Either way, you get good feedback from experts and your fellow hosts on how your talk went. We'll buy you drinks and food. Get any questions answered about how the event will happen. (Also your chance to get first dibs on the speaking slot you want). You'll get tips from Nerd Night's very own WowerPoint Bong, who in his day job is a professional PowerPoint trainer. Boom. The video below created by one speakers (Kamra) showcases some of the workshop section! Humans absorb images 60,000 times faster than text, so use captivating full screen images to get key points across! You must have 20 slides EXACTLY & each must be set for 20s. The first and last thing you say will be remembered most... So start & end your talk with BAIT (Banter, Anecdote, Interaction or Trivia). Don't overwhelm people with too many facts. A couple WOW statistics here and there generally work best. Despite the strict 20x20 format, there's plenty of room for creativity and craziness. Past presenters have even included live drawings, dances, musical performances, and more. You can see some examples of past presentations on the "talk examples" page of this site; browse topics, download sample files, or watch videos. Using Google images to find pictures? Click the "tools" button, then you can select colour = transparent, or large images only, etc. When resizing a picture, don't stretch or skew it, that's basic! Hold down shift whist you drag the corners to resize and it'll look good. Reduce your file size in 5 clicks. Click one picture>Format>Compress pictures> untick box "Apply only to this picture"> OK. Check out some videos from ol' WowerPoint Bong, below. Click Slideshow tab & tick the box for "Use timings"
An interactive text box, so you can type in it during slideshow mode from audience suggestions etc. You'll find out more about this file in the video below or at the WowerPoints Nerd Lab held the weekend before your talk.